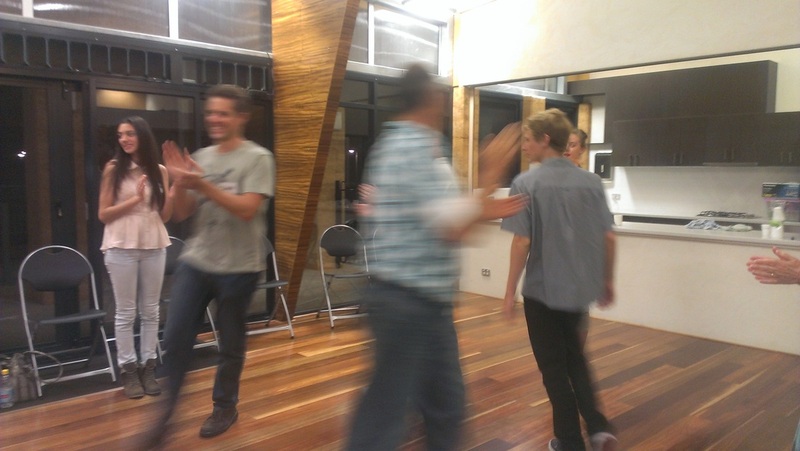 Last night, 26th June 2015, Swan Valley Squares were happy to acknowledge our latest group of beginners to graduate. 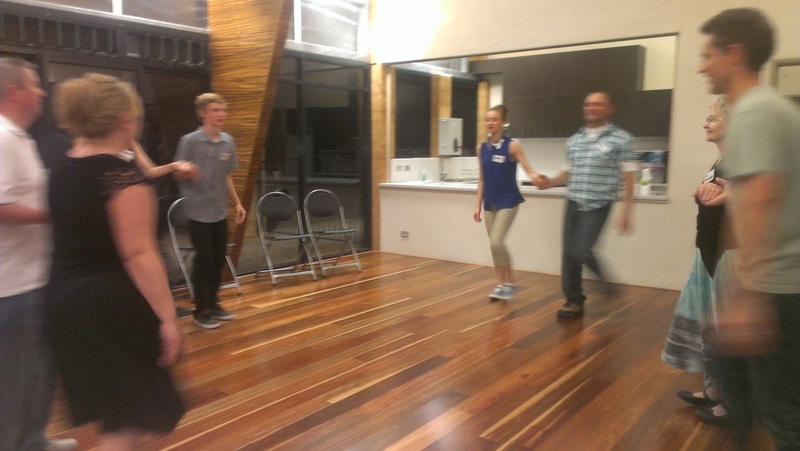 Five dancers have worked hard and long to learn the craft of Square Dancing and amid much fun and laughter have achieved what they may have though impossible at the outset. We congratulate them and welcome them into the family of square dancers. Congratulations to Anna Spadaccini, Jan Darr, Les Burrows, Sandra Hill and Shan-Rose Brown. Look out for them with their new blue "New Graduate" badges at a dance near you. Wow what a fantastic convention the Adelaide people presented. Full of class and colour. Five great days of dancing. Along with overseas dancers from Japan, Germany, United Kingdom, across the ditch cousins New Zealand and a full set plus more from the Beijing Club in China. 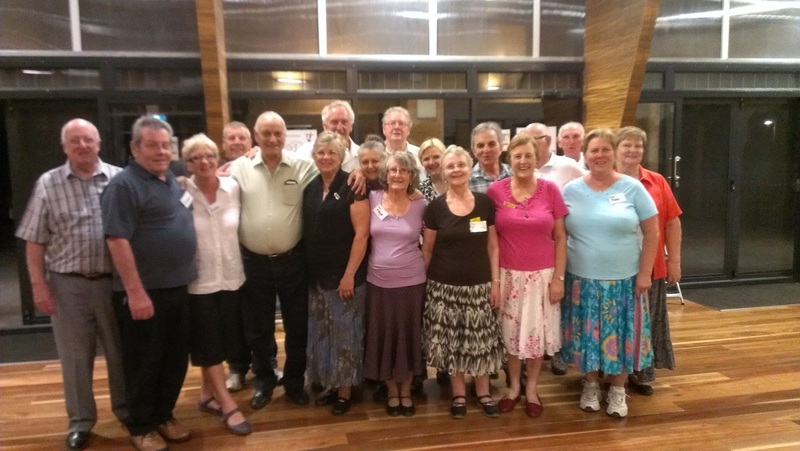 Plan to be at the 2016 convention in Buderim, Queensland. Follow this link by copying it to your web browser to get further details including registration and accommodation details. Here's some pics from the event. Note the young people, including some very young, doing some excellent dancing. Great to see and let's hope we encourage more to take up this great activity. Greek with a hint of Zorba. 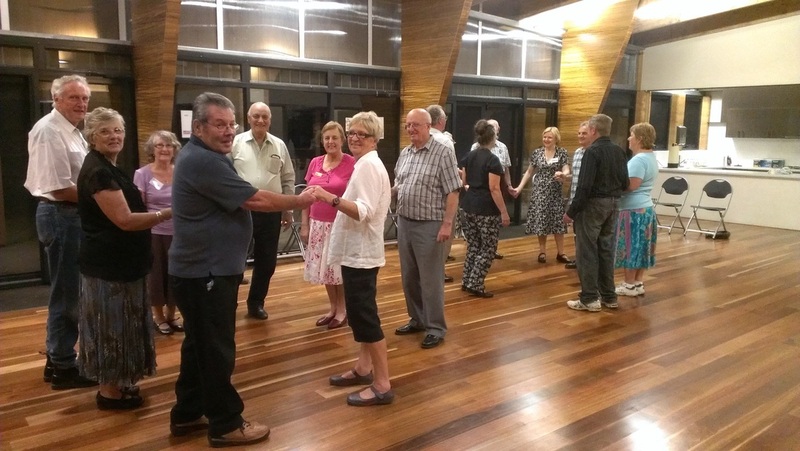 Swan Valley Square Entry in Margaret River Square Dance Club "Teddy Bear Picnic" dance on the weekend of 8th - 10th January 2015. Margaret River Annual Square Dance this weekend. The theme is "Teddy Bears". 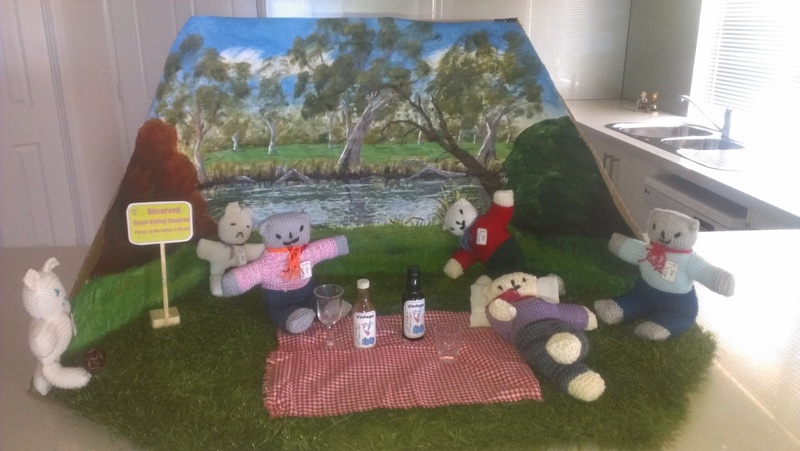 Here is the entry into the "Teddy Bear Picnic" from Swan Valley Squares. Thanks must go to Mike for his fabulous backdrop painting. Not only a skilful Treasurer, superb dancer but wields a great paintbrush too. SVS Christmas Dance - 5th December - A Christmas Carol theme. ﻿Well where has the year gone. The last dance for 2014 was held at the hall on Friday 5th December. To the theme of Charles Dickens "A Christmas Carol" some wonderful costumes were donned and the hall suitably decorated to start the wonderful evening. We were joined by other club members to swell our throng to 8 sets with 7 sets dancing most of the night. Each set was able to be suitably disadvantaged on each occasion as we had nine callers join with us for the evening so there was a spare for every set!! :-) What about the costumes on our Scrooge at the door "Treasurer Mike" and those wonderful servant girls at everyone's beck and call, the wonderful Sandra and Anne. Well done to everyone who pitched in and made the evening the fun and success it was. Thanks must also go to those who made donations to our charity for those with more need than ourselves at Christmas. We handed over a good collection to Midland Anglicare Emergency Relief who will distribute the goods to families to ease the Christmas burden for some. Much appreciated by all.﻿ See you all on the recommencement date for 2015 on Friday 16th January. Another year has passed and the Christmas Functions start again. What a great afternoon we all had on York as they proved once again that a small club can still provide a great afternoon of fun and dancing, not to mention a fabulous afternoon tea that only a country town can tun on. Fifteen of our members attended and from all accounts had a great time, including those who are part of our fabulous beginners group who were made very welcome by Avon Squares. 2014 Beginners Ball - Allemanders "Bad Hair Day" theme. What a beauty. 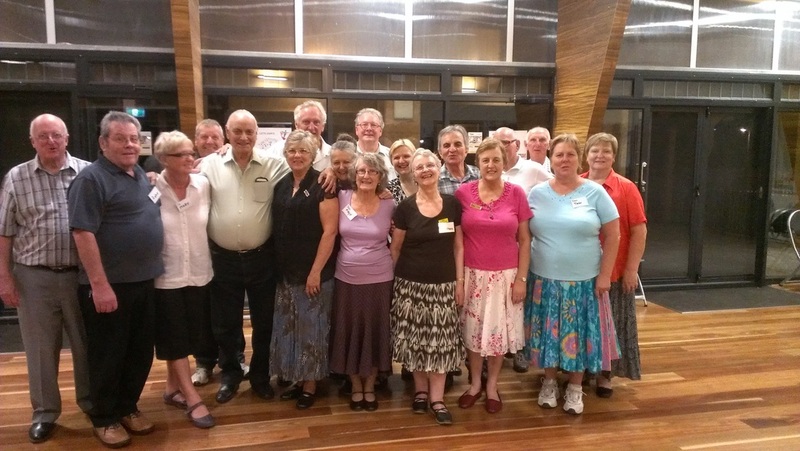 Allemanders Square Dance Club once again excelled themselves in staging a great Beginners Ball with "Bad Hair Day" as the theme. Jim and Leila along with their enthusiastic band of helpers suitably decorated the hall, and along came the dancers in very different hair styles. It was a spectacle for all. Some heads hadn't seen hair for many years and the styles those once balding noggins displayed was a sight for sore and even sorer eyes. Jim presented his new Scottish release dressed in his kilt and sporting a brand new ginger head of hair with Scotsman cap. Well done and we all look forward to many more events from Allemanders. 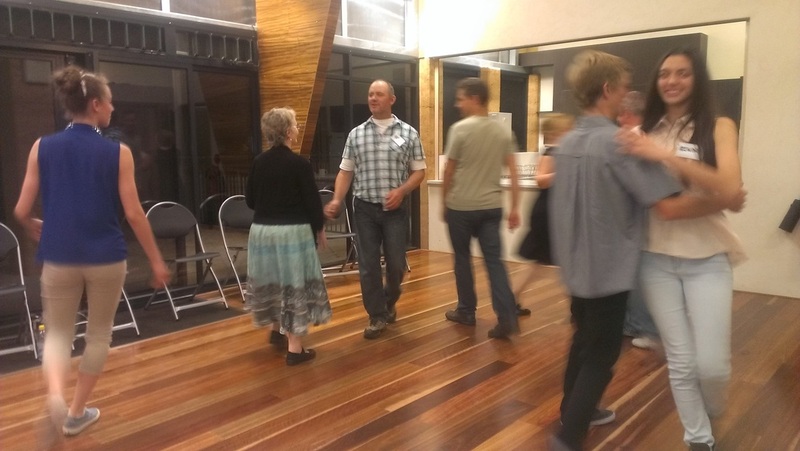 It was so good to see many new dancers, beginners and recently graduated dancers from the North Perth and Como classes along with those from Swan Valley Squares enjoying yet again another introduction to the fun, fellowship and laughter that is typical of the Square Dance Family. spectacular one-thank you! We enjoyed the evening very much....Trish and Bill" , " Congratulations it was a great night and as you said was cosy and kept our elbows in and not so far to walk !!!!! Good luck to you all at Swan Valley Squares ..... Trish"
Well what a night we all had. The committee worked hard to make this a memorable night for our very first set of graduates. Over 100 dancers came from clubs around the metro area to support this fledgling club. Although we were tightly packed you couldn't say there wasn't an atmosphere. Dancing to Spanish themed songs and a floor show from three wonderful Spanish dancers along with a Flamnenco Line Dance which encouraged all the dancers to take part in. The men calling Toro Toro and the women swishing their skirts made for quite a spectacle. Many thanks to all the callers who support us as well and made a contribution to the calling, Richard Muir, Kevin Kelly, Jeff Van Sambeeck, Jim Buckingham, Brian Sims, Trish Holloway, Alan Eades, Robert Dew . A extra special thank you to Happy Wanderers and Kiwilers Clubs for closing their night and coming to join in our celebrations. Also Riverside club for making this one of your club visit nights. We now look forward to continuing to grow and graduate our next set of dancers. Our newly graduated dancers will soon be seen out and about and some are attending the State Convention this year in Albany. Community Connect - Aveley Lakefront Park - 30th March 2014. 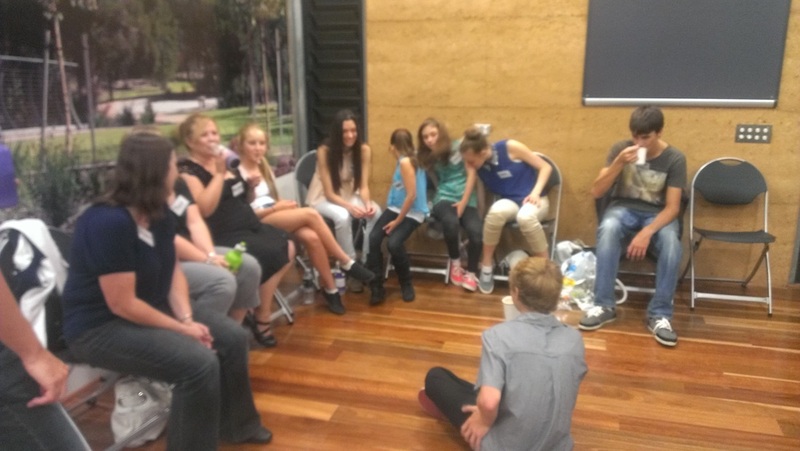 The annual Community Connect event was held at Aveley Lakefront Park on Sunday 30th March from 12.00 noon to 4.00 pm. 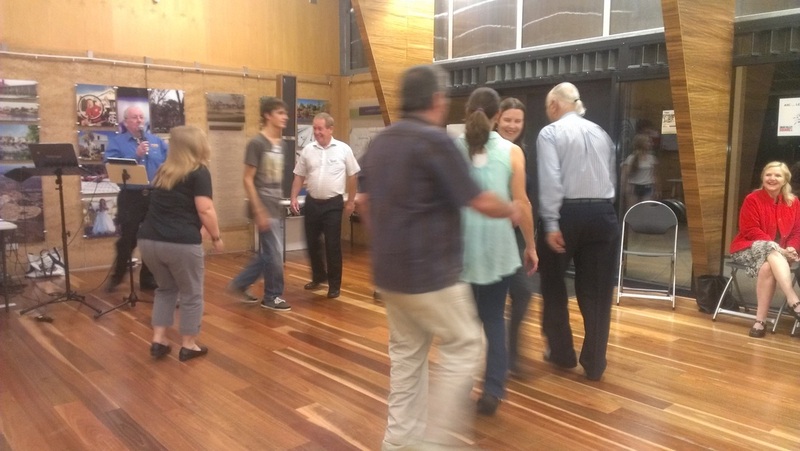 Members of Swan Valley Squares took part in a roster to man our information booth at the Community Group display and hand out leaflets and talk with potential members of the community interested in Square Dancing. A set also put on a dance display on the main stage with a hoedown and two singing calls. As the say in "they done us proud". 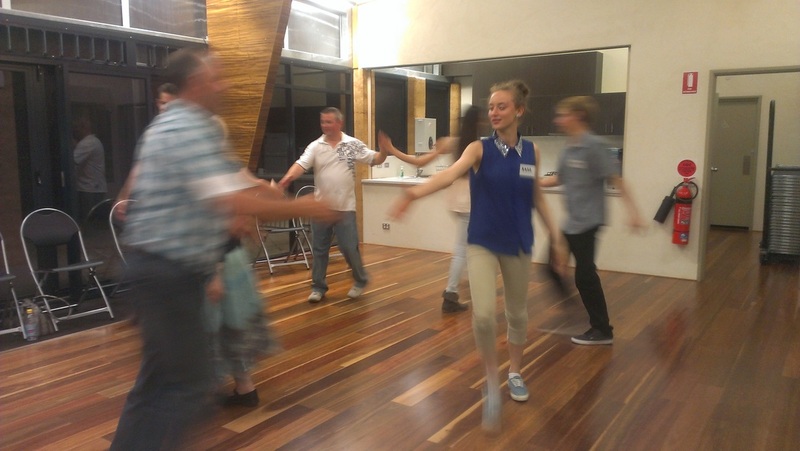 A number of very positive comments were made and the group were an excellent demo set given the limited exposure to public dancing in the past and the short time they have been learning the mainstream movements. 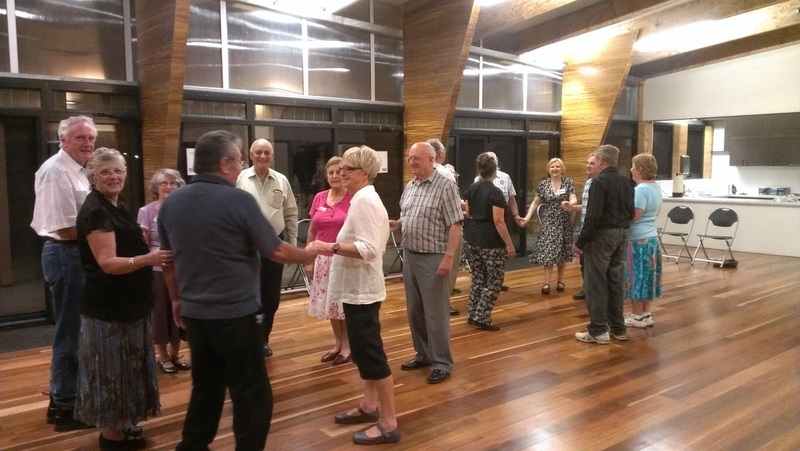 Square Dancing is alive and well in the Aveley and Ellenbrook community. Well done to the enthusiastic Committee and members who all bogged in to decorate the hall and clean up after the event. Thanks to Jim Buckingham and Jeff Van Sambeeck for the support and providing us with a call to enjoy. 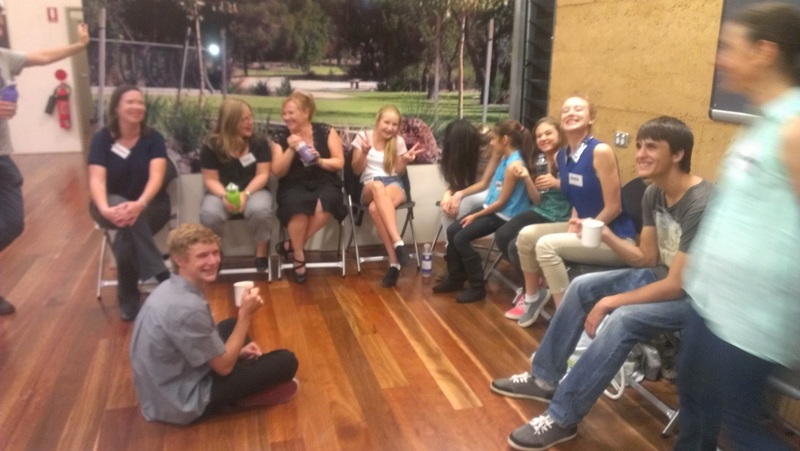 Visitors from Greenfinches, Dianella Rangers, Allemanders and Northenr Stars are also thanked for their support in this milestone for WA's newest club. The members gave a card and gift of roses to Greg and Christine. Trish an Bill cut the cake in recognition of their tremendous support in being the first "angels" of the club. Trish also baked the wonderful cake. 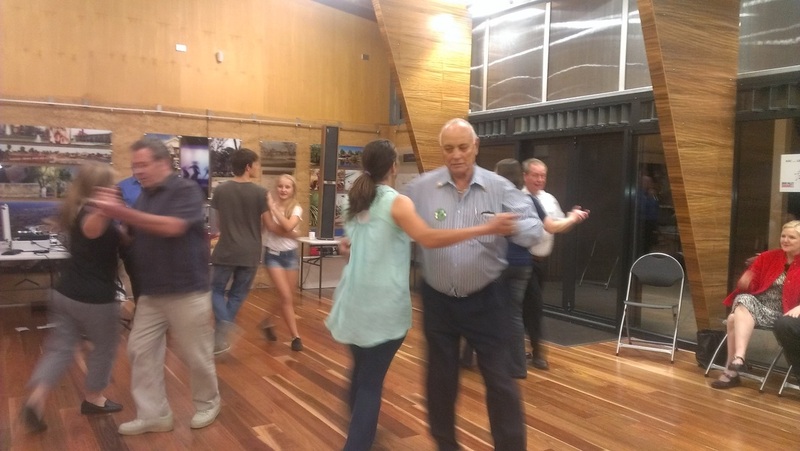 Looking forward to birthday number 2 in 2015.
WHO SAID SQUARE DANCING'S NOT FOR YOUNG FOLK!! The club continues to grow, dancing two sets each night. 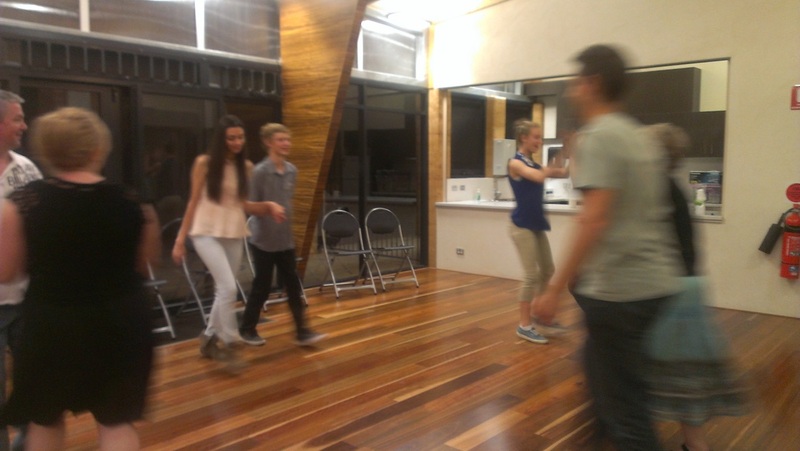 We even have 9 young people under the age of 19 dancing and having loads of fun. March 22nd twenty keen dancers enjoyed another night of ABC Square Dancing. The club has been featured on local radio, 3 local newspapers and at Community Development Events including free picture nights and a Community Connect event to be held on the 6th April in Aveley. 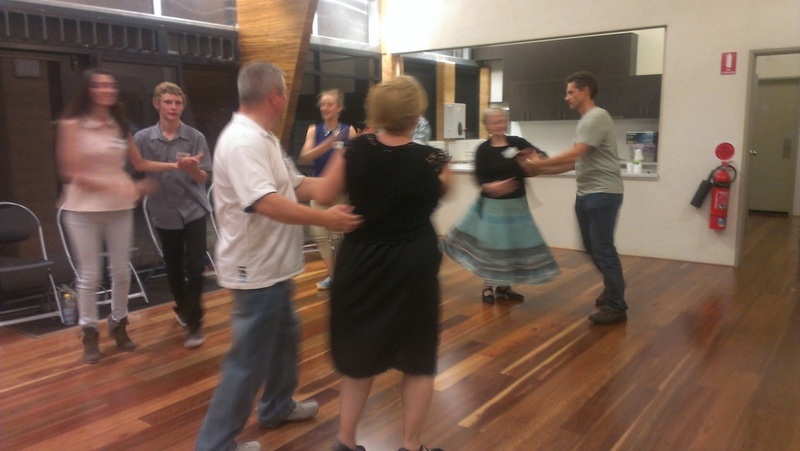 Twenty eight members of the community have attended dance nights to date and others have expressed an interest to attend in the near future. Shopping centre posters and distribution of 5000 leaflets have also helped spread the news that ABC is open and alive in Ellenbrook area. 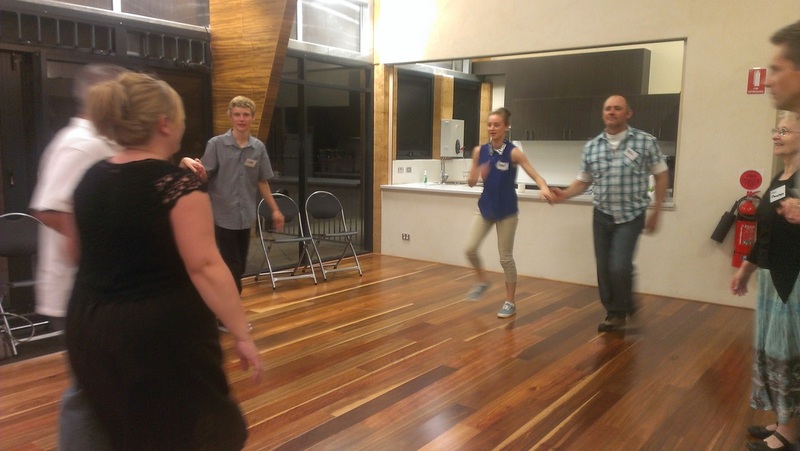 18 Dancers enjoyed a night of fun and dancing to start the first club to be established in the Ellenbrook area.